As this week winds down and you stare down the barrel of a vacation week that you may or may not have planned ahead for…consider the wide range of vacation activities planned by all of your favorite local non-profits. Not sure how we could possibly survive in this area without the amazing offerings of our not for profit organizations (that is tongue and cheek by the way — of course we’d survive, but it would certainly be a lot less FUN). The museums, nature centers, farms, and more that dot the maps of our fabulous Westchester provide more than just obscure “culture” — they offer classes, walking trails, things to do, experiences, education, and most of all FUN TIME FILLERS for us moms. Here are some favorites for the vacation week — some drop off camps, some drop in activities, and some that might just surprise you in that you might learn and enjoy something new your own self! Bartlett Arboretum & Gardens Winter Vacation Camp. The $65/Day* Cure for the “I’M BORED” Blues! Monday, February 20th – Friday, February 24th, 2012 Bartlett Arboretum & Gardens Winter Vacation Camp is a full Day Camp program offered to inquisitive children between the ages of 5 and 11 years. Sign up for individual day sessions or the whole week to give your children a vacation with Nature and learning to last a lifetime. Each day children will explore a different topic related to the botanical and natural world led by our trained Children’s Education staff. A healthy snack will be provided free by the Bartlett Arboretum, however each child is responsible for their own peanut-free lunch. Children should dress appropriately for the weather as we will be spending time outside each day, too, discovering, experiencing, and appreciating the beauty and fun of Nature hands-on! HOURS: 9:00 a.m. – 3 p.m., extended day 3:00 p.m. – 4:00 p.m. Monday, February 20th: Rainforest Ecology, Tuesday, February 21st: Plants in Winter, Wednesday, February 22nd: Habitats from Around the World, Thursday, February 23rd: Desert Ecology, Friday, February 24th: The Wonders of Snow. Please contact Todd DuPont at education@bartlettarboretum.org for more information. Registration required and space is limited. Visit www.bartlettarboretum.org. February Vacation Nature Camp. February 20-23, 9:30 am-1:00 pm. For grades K-3. Activities include nature exploration, nature crafts, animal study and nature games. Snacks included; lunch must be sent daily. Members: $160; non-members: $210. Registration required. Greenburgh Nature Center, 99 Dromore Road, Scarsdale, NY 10583; 914-723-3470 www.greenburghnaturecenter.org. And not to forget the daily fun to be had if you aren’t looking for a full week camp — stop by some local gems for a visit. 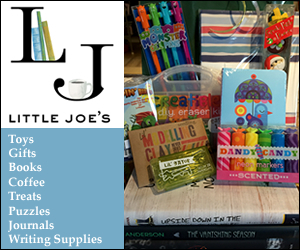 Your local libraries, nature centers, the Quest walks of the Westchester Land Trust, Jacob Burns Film Center for a family movie, or maybe a trip to your favorite local book stores — try Little Joe’s Books of Katonah or The Voracious Reader in Larchmont. Have a wonderful, full, exciting, adventurous week!